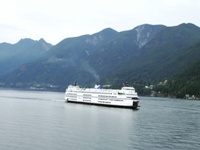 Gibsons is a 40 minute ferry ride from Horseshoe Bay in West Vancouver. The large comfortable car ferry, the Queen of Surrey, takes you past some of the most spectacular scenery in the world. Crossing Howe Sound, you will slip past green forested islands against a backdrop of snow-capped mountains falling to the sea. Seals play about the boat and sea birds follow in its wake. Once you arrive at the Langdale ferry terminal you are just 10 minutes from Caprice Bed and Breakfast. Follow Highway 101 North towards Sechelt. Continue to Pratt Road (Tim Hortons and Gibsons Park Plaza). Turn left at Pratt Road. Stay on Pratt Road to Gower Point Road. (there is a jog at Grandview). Turn right on Gower Point Road and look for 1111, the third property on the left. Alternately, you may follow the sea into Gibsons Landing on Marine Drive and then Gower Point Road (at the Ritz Motel, Gower Point Road turns right and then left two blocks later). Be sure to check B.C. Ferries website. Click on the image for up-to-date schedules, current conditions or to reserve a space on your desired sailing. Super friendly owners, beautiful immaculate home, and gorgeous view. What a treat to walk from our private suite with a 4 poster bed and kitchenette onto a beautiful deck surrounded by flowers, cedars, a swimming pool and hot tub.....all this with a view of the cruise ships passing by on their way to Alaska!